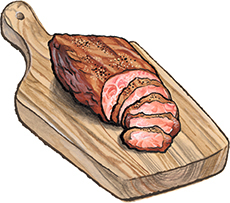 Tri-Tip Steak from Carman Ranch for sale. Buy online at Zingerman's Mail Order. Gourmet Gifts. Food Gifts. The tri-tip is a triangular cut of beef that’s nicely marbled, intensely flavorful, and a little tricky to cook. Overdo it and it can get a bit dry. But grilled to a perfect medium it’s juicy and makes for stupendous eating. In California, it's traditional to cook up a tri-tip over high heat on the grill, seasoned with a bit of salt, pepper, and garlic, and served alongside a fresh salsa. It's also a great cut for marinades. We’re getting our tri-tips from Carman Ranch in eastern Oregon. The cattle spend their whole lives on pasture eating grass, and they’re only harvested in the summer when the cattle are at their plumpest and the beef is the most flavorful. While Carman Ranch isn't certified organic, they follow organic practices: no fertilizers or pesticides in the fields, and no hormones, sub-therapeutic antibiotics, or grain for the cattle. All the little steps add up—this is really, really good beef. Ships frozen, arrives frozen or cool.